With a stunning view of cloud-wrapped mountains near the continental divide in western Panama, the Jorge L. Araúz Research Center offers simple living facilities and excellent access to the largely unspoiled wilderness of the 19,500-hectare Fortuna Hydrological Reserve and the adjacent Palo Seco Forest. The reserve encompasses an elevational transect from sea level to 1,400 meters on Panama’s Caribbean slope. Trails beginning at the highway provide access to forest on diverse soil types. Fortuna’s extensive hydrological reserve allow scientists to study how changes in land use and climate affect tropical highland forests, which grow in dramatically different environments than their lowland counterparts. At higher elevations, temperatures are cooler and tree communities have different strategies for survival and regeneration. Today’s warming temperatures, however, appear to be causing clouds to form at higher elevations, which may already be contributing to species migrations. Insect taxonomy, amphibian decline, soil nutrient dynamics and microbiology are also part of Fortuna’s scientific program. The Fortuna Hydrological Reserve was established in response to a call for a better understanding of the impact of the Edwin Fábrega Dam on the upper Chiriquí River in western Panama. The reserve is jointly managed by Panama’s Ministry of the Environment, or MiAmbiente, and ENEL Fortuna, S.A., the company that oversees hydroelectric power generation at the dam. The Missouri Botanical Garden documented 1,880 species of plants and published A Checklist of the Fortuna Dam Region, Chiriquí/Bocas del Toro, Panama. Panama’s national electric company set up a small scientific station to monitor temperature, rainfall and weather. Entomologist Henk Wolda set up the first insect light trap and STRI staff scientists Dave Roubik (pictured here) and Don Windsor launched entomological studies. Gerhard Zotz, of Germany’s Universität Oldenburg, and his students working with STRI plant physiologist Klaus Winter, started studying epiphytes and bryophytes. Herpetologist Karen Lips, from the University of Maryland, began to monitor amphibian populations after biologists in Costa Rica reported severe amphibian declines. Jim Dalling (on the right), an ecologist at the University of Illinois, and his students launch long-term studies of forest structure and dynamics, ecology and physiology. This small field station has a permanent staff of one person. Fortuna’s field station is locally known as the Green House, or Vivero, in Spanish. The station keeps it simple but still has cozy facilities that meet basic needs for successful field studies and courses. There are simple accommodations, a 4x4, Internet, greenhouse and some basic equipment for processing samples. The station has bedrooms with four beds each, linens, pillows, blankets and towels. It can get chilly at night so bring extra bedding or a sleeping bag. Potable water is available but visitors will need to bring in their own food and plan ahead — the closest supermarket is 60 km away in the city of Davíd on the Inter-American highway. For groups, arrangements can be made for a cook with the Visitor Services Office. There is a small store in the town of Hornito about 10 km from the station. Some fresh, seasonal fruit and vegetables can be purchased from roadside stands at the Fortuna Dam. The station has a washer and dryer. The research station has large main room for classes, workshops or meetings and a covered outdoor work area. There is a greenhouse, a large walk-in storage and dry room with an herbarium. Equipment includes an electronic balance, a small drying oven, one stereo microscope and one optical microscope. There are 110v electrical outlets and a couple of 220v outlets. Internet service is available but not always reliable and mobile phone coverage is spotty. A 4x4 pick-up truck is available for fieldwork. It can be booked in advance with the station caretaker, Carlos Espinosa. The closest gas station is in Gualaca, 30km from Fortuna towards David. 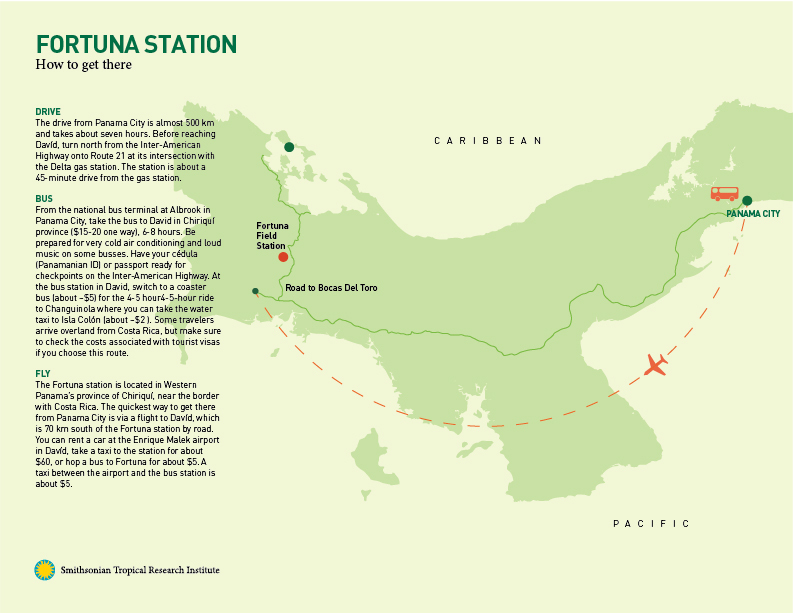 The Fortuna station is located in Western Panama’s province of Chiriquí, near the border with Costa Rica. The quickest way to get there from Panama City is via a flight to Davíd, which is 70 km south of the Fortuna station by road. You can rent a car at the Enrique Malek airport in Davíd, take a taxi to the station for about $60, or hop a bus to Fortuna for about $5. A taxi between the airport and the bus station is about $5. The drive from Panama City is almost 500 km and takes about seven hours. Before reaching Davíd, turn north from the Inter-American Highway onto Route 21 at its intersection with the Delta gas station. The station is about a 45-minute drive from the gas station. The bus ride from Panama City to Davíd is six-eight hours and costs $15-$20. From the Davíd station, grab you bags and look for a bus headed to Chiriquí Grande. Tell the driver that you’re going to the Smithsonian at Fortuna. Buses in Panama can be extremely air conditioned — especially if you take an overnight express — so be prepared with a sweater, sleeping bag or blanket. Earplugs may also be helpful if the driver decides to play loud music or an action movie.